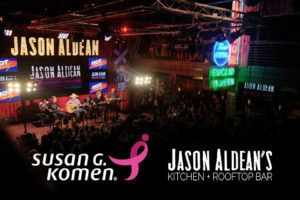 As an avid supporter towards the fight against breast cancer, current three-time CMA nominee Jason Aldean will celebrate his annual “Concert For The Cure” at Jason Aldean’s Kitchen + Rooftop Bar in Nashville on Oct. 3rd. With all proceeds benefitting Susan G. Komen Central Tennessee, the night continues Aldean’s longstanding partnership with Susan G. Komen after raising more than $3.6 million to benefit chapters across the country. Fans will be treated to an intimate performance by the three-time ACM Entertainer of the Year after a three-course meal off the restaurant’s menu, with all food being donated courtesy of TC Restaurant Group. A limited number of tickets are now available for $100 (exact seating is based on group size and time of guests’ arrival). Photo ID required at door. Name on ticket order must match photo ID.